Everything tastes better with bacon- it's a proven fact. Watch any cooking challenge show and you'll see the judges drool at any dish with bacon. It's a sure fire win! Even with the bacon and caramelized onions, this comes across as a relatively lighter breakfast. And the blueberries give it a hint of a built-in-dessert. It's fat and happy together on a plate! Enjoy! Tips and Techniques: Don't be alarmed if the first couple of crepes don't work out- it's normal. Just take your time with them and allow do allow plenty of time for the batter to rest. Blend all ingredients in a blender or whisk by hand until smooth, set in the refrigerator for about 1 hour (this gives the batter time to rest and resolve all air bubbles). The batter should be about the consistency of heavy whipping cream. Heat up a skillet (use one about 8 inches wide) and bush with melted butter. Pour in about a scant 1/4 cup of batter- twirl the pan so only the bottom is covered with batter. 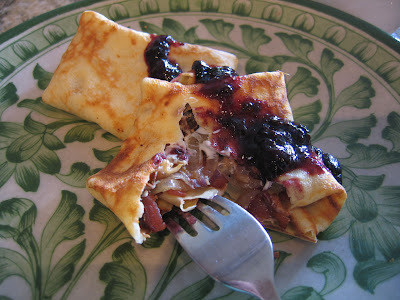 Flip when the crepe begins to lightly brown, brown on second side. Repeat. Stack the crepes and leave in a warm oven until ready to fill. While your crepe batter is resting, cook the bacon and onions. Use the bacon pan, leaving about 2 tbls of bacon fat in it. Add the onions, sautee to caramelize. add in 1 chopped clove of garlic when the onions are about half way cooked. 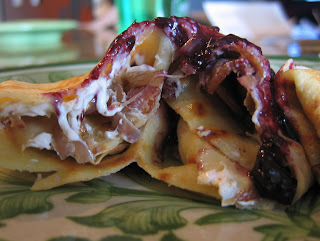 Place the onions and bacon in a ceramic dish- put in the oven to keep warm until the crepes are ready. Add 1 cup of sour cream, salt and pepper to the the bacon mix before placing in the crepes, the warm mixture will 'melt' the sour cream. Simmer (if the sauce gets too thick, add in a splash of stock). Add in a dot of butter just before serving. 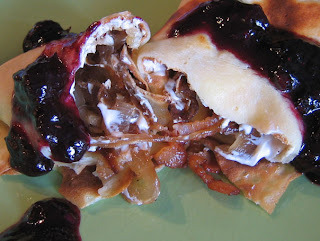 Take one crepe, place a big dollop of the bacon sour cream mixture in the middle, and fold to a square. Pour a spoon of simmering blueberry sauce over the top. Serve.